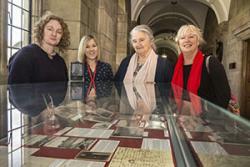 From left: Iona Rhys Cooke, Lynette Hunter of Bangor University with Luned Gonzalez and Nadine Laporte, great grand-daughters of Michael D Jones and Lewis Jones.Bangor University’s Library and Archives Service received a special visitor recently, Luned Gonzales, a direct descendant of the Welshmen who colonised part of Argentina 150 years ago. Luned has lived in Patagonia all her life and is currently on a trip to Wales. She has a busy programme of events arranged for her, but managed to visit the University to see ‘The Welsh in Patagonia’ exhibition. Luned Gonzales, has an impressive pedigree when it comes to the history of the Welsh in Patagonia. She is the granddaughter of Llwyd ap Iwan and his wife Myfanwy Ruffydd, and the great-granddaughter of Michael D Jones, a pioneering figure of Y Wladfa and Lewis Jones, the first leader of the Welsh colony. Luned Gonzales gave the exhibition her seal of approval and, along with Iona Rhys Cooke (also Michael D Jones' great grand-daughter) on behalf of the family, presented Lynette Hunter of the Archives with a gift, a glass plaque with an image of Michael D Jones. The exhibition is open to the public and can be seen in the Council Chamber Corridor of the Main University Building and runs until the end of December.